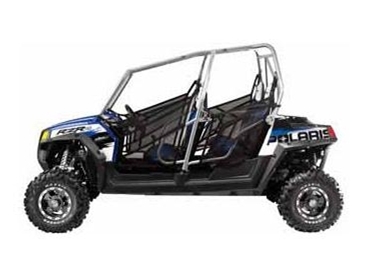 Polaris Industries presents the Ranger RZR 4 multi passenger sports side-by-side vehicles designed as the industry's only 4-seat high performance machines. The new Ranger RZR 4 multi passenger sports side-by-side ATVs feature a high-output twin EFI engine that cranks out 53 HP and delivers fast acceleration from 0 to 56.3 kmph in 4.4 seconds. The redesigned body features a new front end styling for an even more aggressive look while riding in the dunes or in the desert. The redesign also increases the cooling airflow area by 29%. The Ranger RZR 4 multi passenger sports side-by-side vehicles also incorporate a highly responsive and smooth electronic power steering with Variable Assist for easier steering at lower speeds and greater responsiveness at higher speeds. The compression and preload-adjustable suspension soaks up deep ruts and delivers a smooth, precise ride every time. The Ranger RZR 4 all wheel drive vehicles (AWDs) are designed for comfortable riding, thanks to the adjustable and interchangeable bucket seats in addition to the adjustable front passenger handrail and full rear passenger handrail. Driver comfort is enhanced with the tilt steering feature incorporating high range of motion (25.4 cm).